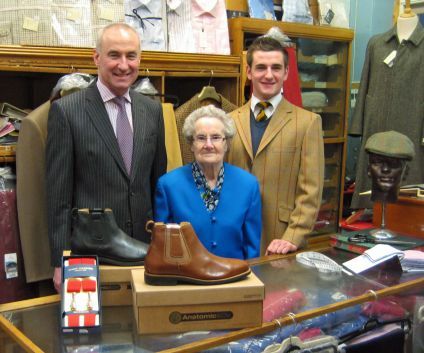 We are a family business with over 40 years experience in traditional men's clothing. 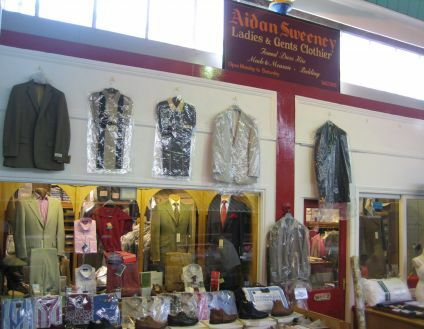 I opened our gentlemen's outfitters shop in Brecon's historic Market Arcade in 1986. We specialise in top quality men's made to measure suits, Magee personal tailoring, and Magee Donegal tweed sports jackets. We also have many years experience providing ladies underwear and traditional household items. You receive dedicated personal service, whether you come to the shop or contact us by phone or online. My mother, Mrs Sweeney, works in the shop six days a week. She turned 90 in 2014 and still going strong! Mother looks after our ladies underwear, especially Sloggi briefs and Triumph Doreen bras, and helps with the administration and packing of our internet orders. The third generation is my son James. He helps out when his career in events management allows, and manages the shop with his grandmother when I am travelling to see made to measure customers. He loves smart, quality, classic men's clothing - and adds a contemporary twist too. We have antique fixtures and fittings, a traditional wood and glass counter, and a 1930s till - and our customers want it to stay just as it is. This website is an addition to the shop, not a replacement for it. Our shop is in Brecon's historic Market Arcade, which leads to the Market Hall. The Arcade is also home to an independent wool shop, an independent grocer, and an independent butcher - run for over 30 years by my brother Paddy. Made to measure suits, Magee Donegal tweed sports jackets, Anatomic Gel shoes and boots, and extra long braces are specialities. We provide hard to find larger sizes of clothing and underwear - especially men's Jockey and Sloggi briefs, ladies' Sloggi underwear, and Triumph Doreen bras. Our men's hirewear includes evening wear, morning wear, lounge suits, shirts, shoes, and accessories - outfits for all formal occasions such as weddings, Christenings, funerals, graduations, dinners etc. For suit hire, please contact us on 01874 623613 in advance of your function. Other stock includes shirts, socks, vests, boxer shorts, handkerchiefs, dressing gowns, hats, caps, umbrellas, Egyptian cotton sheets, duvet covers, ladies' bed jackets and bed socks, seersucker tablecloths, long bolster pillows, traditional cotton roller towels, and range towels. Contact us on 01874 623613 to ask about items that are not in the online shop. We concentrate on high quality, long-lasting products. This helps you and the environment, because items do not need replacing frequently. Personal service, attention to detail, and providing top quality products for you are our hallmarks. Value for money is important, so buying quality items is a rewarding investment. Classic menswear lasts for years and stays stylish beyond high street trends. Made to measure gives you an individual touch too, with options for many different design details and monogramming. Whether you would like a formal suit, a Donegal tweed suit, a casual suit, a tweed overcoat, a jacket or trousers, you will find what you need amongst the hundreds of fabrics and linings in our personal tailoring and made to measure clothing ranges. I personally oversee all men's made to measure menswear orders, from the initial enquiry until you are wearing the garment. Phone me on 01874 623613 for a chat about your requirements. People from all walks of life use our shop. It is a great pleasure to meet many of you regularly in Brecon. 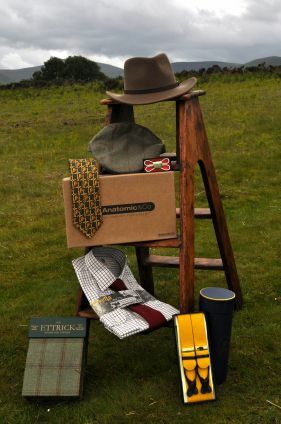 Menswear customers include local families, farmers, boys and masters at Christ College in Brecon, military men (we also dispatch to BFPO addresses), funeral directors, and professional people such as solicitors, barristers, architects, and accountants. We value all your custom. Customers from all over the UK and abroad regularly come back to the shop in Brecon. Some are from families with local Welsh connections, some are people who found us when holidaying in Wales, and many are from word-of-mouth recommendations. They include politicians, a best-selling crime writer who lives in the United States, a consultant to the Prince of Wales, a television news anchor, and leading barristers. I record each customer's personal order by hand in a leather-bound ledger. There are thousands of entries in three huge volumes. This is a tradition we carry on in parallel with the website. We have website customers from all over the world as well as throughout the UK. Some are ex-pats who have Brecon connections, some are people who found us while on holiday in Brecon, and many find us via internet searches. Brecon is a small market town in the Brecon Beacons National Park in South Wales, UK. You can reach us easily by car from the Midlands, the West of England and many parts of Wales. There are railway links to Abergavenny, Newport, and Hereford. Brecon is a good base for exploring the Brecon Beacons National Park. There is plenty of accommodation locally, including hotels, B&Bs, guest houses, bunk houses, campsites, a Youth Hostel, and holiday properties such as the wide selection of lovely self-catering farmhouses and cottages throughout the area offered by Brecon Beacons Holiday Cottages.